Many of us who devote care and attention to the spaces in our personal lives neglect to do the same in our professional space. Considering the time that we spend in our workplaces, it's worth a small investment of time and money to make them comfortable as well as functional. Plus, your office space speaks volumes to those who visit it. An organized, inviting and peaceful office with a few creative touches not only impresses your colleagues...it also draws them to you, creating a collegial working environment. 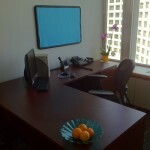 The first step toward an appealing and functional office is a clean desk with plenty of space to work. Organize your files in drawers or attractive containers, and keep loose paperwork to a minimum. As it is at home, too much visual clutter can create mental clutter and cause difficulty focusing. An office with a proper door and natural light, of course, starts you off at an advantage. Whether you work in a corner office or a cubicle, consider bringing in outside light sources to create an atmosphere that's suited to your work. Sharp task lighting is great for detailed paperwork while soft, warm lighting is better for conversational spaces. Bring color into your space by choosing coordinated folders and desk accessories. Use inexpensive fabric such as sheeting to cover cork boards. Highlight appropriate art pieces and photographs that make you feel comfortable and inspired in your office. Display a few awards or accolades of which you're proud. Just don't overdo it - you (normally) don't want to intimidate your visitors! Natural elements such as plants go a long way to enliven your space. A bowl of fresh fruit is decorative and provides a healthy snack when you're having a hectic day.